Premiere revolution de la mer Caspienne ou Carte qui indique son Etendue vers le tems de la Population Primitive de l'Asie. Seconde Revolution de la mer Caspienne ou carte de Ptolemee. Troissieme Revolution de la mer Caspienne ou carte d'Abulfeda. Quatrieme Revolution de la mer Caspienne ou carte du Czar Pierre le Grand Rectifiee par Mr. d'Anville. 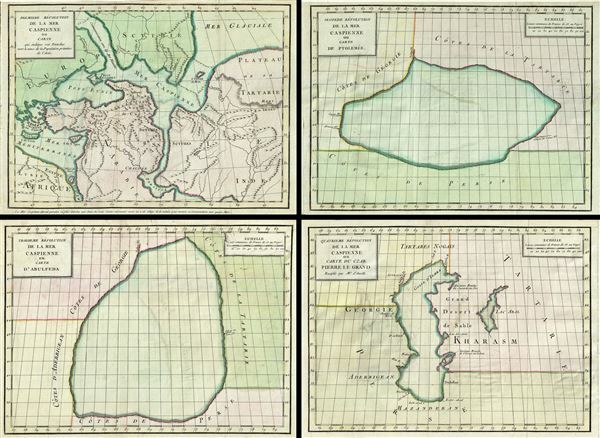 This is a fascinating 1792 set of four maps of the Caspian Sea by Jean-Baptiste-Claude Delisle de Sales. They illustrate the mapping of the Caspian Sea over time. The second map in this series purports to depict the Caspian Sea according to 2nd Century BC Alexandrian geographer Claudius Ptolemy. Although the map depicts the Caspian in a bulbous horizontal form, Ptolemy's analysis of the sea is significant as one of the first agree with the views of Herodotus and Aristotle in asserting its landlocked nature. This map depicts the Caspian Sea surrounded by the coasts of Persia, Tartary and Georgia. The third map illustrates the Caspian Sea as mapped by the 13th century Kurdish historian and geographer, Abulfeda or Abu'l Fida. The map notes the Amu Darya or the Amu River (Gihon or Oxus River). The form of the sea has here evolved significantly and begins, at last, to take on a more north-south orientation. This map depicts the Caspian Sea surrounded by the coasts of Persia, Tartary, Georgia and Azerbaijan. The fourth map in the series, bottom right, cover both Caspian Sea and Lake Aral. This map marks a significant step forward in the mapping of the region. Around 1718 Russian Tzar Peter the Great, sponsored a number of cartographic expeditions to the farthest reaches of his vast empire. One such was a command to map the Caspain Sea given to Dutch navigator Carl Van Verden. Though well known since antiquity the world's largest lake was largely ignored by surveyors until Van Verden's work in the early 18th century. Van Verden's work was the most advanced mapping of the Caspian Sea to date, offering a new perspective on the region and opening the navigational possibility of the world's largest lake. Peter the Great, Russia's most expansionists Tzar, was determined to make the Caspian a 'Russian Lake' and invaded the region in 1722 seizing Derbent and Baku. These maps were issued by Delisle de Sales in his 1792 edition of Histoire du monde primitive. Delisle de Sales, Histoire du monde primitif, (Paris) 1792. Very good. Set of four maps. Minor wear along original fold lines. Minor offsetting. Original platemark visible. The third map exhibits minor damage and verso repair in the top right quadrant. All maps are professionally flattened and backed with archival tissue. Blank on verso.